The movie shootout might be one of the most popular and recurring scenes in movie history. Any genre of film can contain a shoot out and most of the time movie shootouts are pretty poor. It might just be one dude shooting at another dude without any energy or life to it, or worse, it’ll have the problem the recent Taken films have had and be shot by the shakiest cameraman in the world and be basically unwatchable. Great movie shootouts are the ones which transcend the film around them, however good the films themselves actually are, and become something special. Whether they are refreshingly original, gut wrenchingly violent, or just damn cool, movie shootouts can be the most memorable parts of a film. If they are done right of course. Read on to see 10 of the best shootouts in movie history! 10. The Boondock Saints – There was a fire fight! The Boondock Saints is that sort of film where nearly every critic hated it but for some reason fans were of a completely different opinion. While The Boondock Saints only has 20% on RottenTomatoes (calling it ‘juvenile’ and ‘ugly’), it has 7.9 on the user voted IMDB and I believe the reason lies mostly in it’s fun and creative action sequences. The film is also incredibly quotable and boasts a brilliantly hilarious performance from Willem Dafoe, but the best part of he entire film is the shootout outside the house, against Il Duce, played by Billy Connelly. The action is great any way, filmed in the over-the-top style that permeates the entire film, but the reason this is one of the best shootouts in movie history is down to Dafoe. He comments on the action after it has happened but is mixed in with the characters in the gunfight, as he slowly unravels. Add in slow motion, classical music and lots of fake blood, for an awesome, over the top and creative gun fight. 9. The Way of The Gun – The finale. It’s a shame that The Way of The Gun is, unlike most of the films on this list, pretty rarely seen. It boasts good performances, great direction, an original story and a really great cast, including the likes of Benicio Del Toro, Ryan Phillippe, James Caan, Scott Wilson and Taye Diggs. When people do talk about the film they don’t mention any of this, as it is all overshadowed by the awesome gunplay and the brilliant finale. 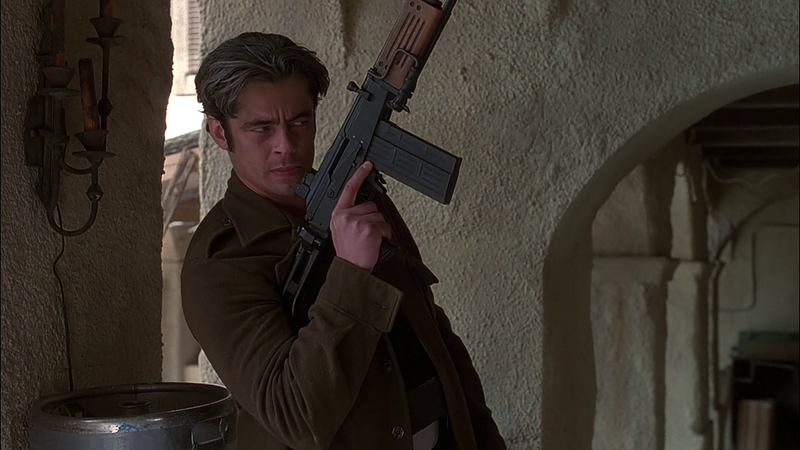 While the movie does boast realistic gun techniques, that doesn’t mean it’s boring. The action is fast and brutal and our main characters are outgunned from the very beginning. In fact, the finale takes place in the same location as the final stand in the brilliant 1969 western Butch Cassidy and The Sundance Kid, so you know from the start that the heroes could be in trouble. Brilliantly brutal and wonderfully choreographed, The Way of The Gun is an underrated crime classic with a killer finale. 8. Django Unchained – Candyland showdown. What else is there to say at this point about Quentin Tarantino? His movies are respected by film critics and casual movie goers alike, and often end up on a lot of peoples yearly ‘best of’ lists. His most recent film Django Unchained was no different, winning Oscars nods for both it’s writing and performances. But that was to be expected of Tarantino at this point, the real surprise was just how awesome the big shootout at Candyland was. Of course Tarantino has done action before but it’s usually limited to fights (Kill Bill) or car chases (Deathproof), his shootouts in things like Inglourious Basterds were good but he shows in Django that he’s capable of so much more. The scene is expertly choreographed and awesomely violent, plus it has all of those Tarantino signifiers such as the fun music. Like a lot of his work, the Candyland shootout in Django Unchained just exudes cool and is a whole lotta fun. 7. Equilibrium – Saving the puppy. Equilibrium is a great film. Forget what the critics said; any film that contains Christian Bale running around performing ‘gun-kata’ has gotta be at least decent. You could fill half of this list with shootouts just from Equilibrium but I believe the scene where Cleric John Preston first goes against the totalitarian regime to save an adorable dog is top of the list. In a world where feelings aren’t allowed, Preston has just been ‘awakened’, and is trying to hide a dog from the authorities he works for. The tension is built beautifully and you think Preston will get away with hiding the dog. Until he doesn’t, and everything becomes awesome. The scene is brilliantly shot and is complemented by some interesting lighting and clear direction. You see every move John makes, despite the fact he’s moving nearly lightning fast, and you can’t help but get caught up in the moment. An awesome moment from an awesome, but sadly underrated sci-fi action flick. 6. Léon: The Professional – Hostage negotiation. The next entry on the list goes to Luc Besson’s brilliant Léon: The Professional. To be honest, multiple films that Besson has been involved in over the years could have featured in this spot, from the superb The Fifth Element, which he directed, to the more recent Taken (the first and only good one), which he wrote. But no Besson shootout comes close to matching the sheer awesome-ness of the the ending to his best film; Léon: The Professional. The performances are all great, especially Gary Oldman’s scene chewing turn as unhinged DEA Agent Norman Stansfield and the action is as violent as we ever could have hoped for. The scene is also special for being incredibly clever, both in the way it is set up and through the direction. Léon himself might not have the best odds but he sure as hell tries, setting us up for both a spectacular, and ultimately bitter sweet ending. 5. Desperado – Bar room brawl. Desperado, directed by the brilliant Robert Rodriguez, is perhaps the pinnacle of both his career and star Antonio Banderas career (and this is coming from a big fan of Assassins). The film perfectly captures the brilliance of the tex-mex themes of Rodriguez’s career, as well as containing some extremely awesome shootouts. The best shootout in the film though, is the standout action scene set in Cheech Marin’s Tarasco bar. 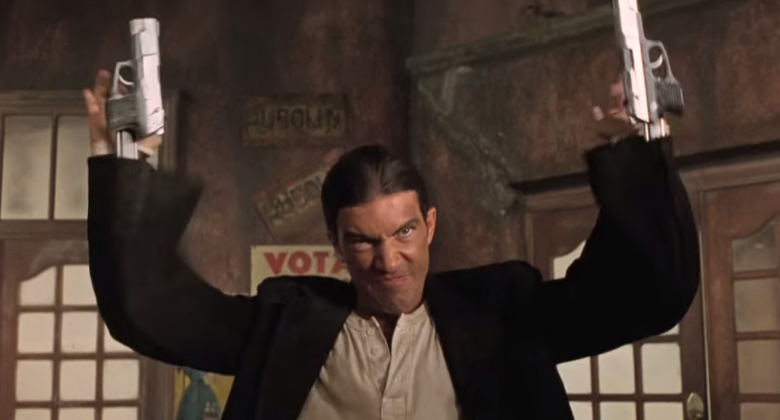 Guys get shot in a symphony of violence by Banderas who is prancing around the place like he’s training for his upcoming role in The Mask of Zorro. The whole scene is very cool, and isn’t even ruined by an extended cameo from Quentin Tarantino. Rodriguez has made some awesome movies in his time, including From Dusk Till Dawn and Sin City, but none of them top this scene in Desperado for sheer brilliance. 4. Face/Off – Face off. This isn’t the only John Woo entry on this list but the film itself is perhaps my favourite of his, not in small part to the presence of Nicolas Cage and John Travolta, who compete to see who can chew the scenery the fastest. It’s wonderful. The highlight of the film comes when Cage, who is playing Travolta’s character (good guy Sean Archer in the body of bad guy Castor Troy), is attacked by Travolta playing Cage’s character (bad guy Castor Troy in the body of good guy Sean Archer). Hell on earth is unleashed; bullets fly, bad guys get plugged and, in a superb moment of contrapuntal sound, Over the Rainbow by Olivia Newton John gets played. It’s text book John Woo topped off with a bunch of people diving through the air, firing guns, all in glorious slow motion. It’s awesome. 3. Hard Boiled – Intensive care. Hard Boiled is the second John Woo entry on this this and I really had to fight myself to not put more on. His whole filmography is littered with brilliant shootouts, but perhaps the best of his career features in his magnum opus; Hard Boiled. Not only does the entire scene last a gloriously long time but it features many different scenarios so it never becomes boring. Again, the whole thing is greatly directed by Woo with the particular highlight being the long take which lasts nearly three minutes and is brilliantly explosive and brilliantly choreographed. There’s no CGI here, all the explosions are real and, for the most part, it’s actually the actors doing the crazy stuff which really helps, making the film just that much more believable. Hard Boiled is an action master piece. 2. Scarface – Say hello to my little friend! Scarface is, undoubtedly, one of the best films of the 1980’s. Filled to the brim with the sort of excesses that typified the decade like neon, violence, and cocaine, it’s a fun ride from start to finish. And what a finish it is. The film is already beautifully over-the-top at this point but somehow the final shootout takes it one step further. Tony Montana’s enemies are storming his mansion, his guards are dead, his sister is dead, and he is high as a kite on nose candy. He takes his M16 with a grenade launcher attached and makes his final stand. It’s incredibly violent and loud and is extremely awesome to boot. Director Brian De Palma shoots the whole thing with his trademark energy and we cheer for Tony as he kills people, despite him also being a despicable human being. As we know, Tony doesn’t make it, but he does manage to supply us with one of cinemas greatest shootouts before he goes. 1. Heat – The Heist. There really couldn’t have been anything else in the number 1 spot could there? Michael Mann’s Heat is a bona fide classic and contains one of the coolest and most astounding shootouts in cinema history, and the films it has influenced can be seen all over the place (I’m looking at you The Dark Knight). Robert DeNiro’s bank robbing character Neil McCauley, along with his gang of criminals has just hit the biggest score of their careers. It’s a heist we’ve seen them meticulously planning for weeks before, so we as viewers are also invested in the outcome. But we have also been following Al Pacino’s Lt. Vincent Hanna and his police force as they try to catch out Neil and his gang. This leads to the moment the two sides meet, outside of the bank, resulting in the best shootout in cinema history. Mann shoots the scene with little to no music, making the scene incredibly visceral but also allowing us to listen to the extremely realistic sound design. Every gun shot sounds real and our characters react to each one. Mann’s staging and shooting of the scene is especially great as it is clear, and allows us to follow the action in a way not many other films have achieved. The guns are loud, characters get killed off, Al Pacino shouts, and the audience gets to enjoy the best shootout ever put onto film.